Highmoor Firecracker, a little hackney horse with a huge heart. 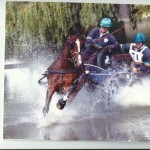 Cracker had to be put down on the 7th of April at the fine old age of 27. I bought Cracker from James Crothers of Derrylough when he was seven and over the next twenty years we developed a great friendship and partnership. The first few years were to say the least quite trying ,having been shown in hackney classes a few times ,where he had to show his exuberant and extravagant hackney paces ,it was quite difficult to re-educate him to my way of thinking . 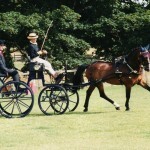 At horse driving trial which was my preferred equestrian sport, require for the dressage test, a variety movements driven in various paces in a controlled manner. Followed by the cross-country phase, 5 sections over hills and dales, driven at set paces and in the final section driving round built gated obstacles .The final phase of the competition the cone section were you drive through a course of pairs of cones with balls on top .This is to show the suppleness of the horse and accuracy of the driver .Cracker was very keen to do the work but not always at the desired pace or with the control I would have liked. 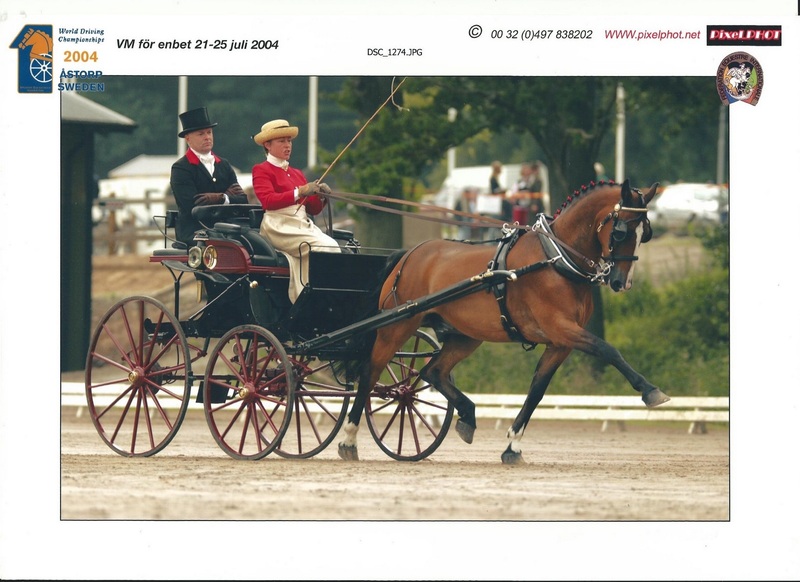 Over the years and with much schooling and a great deal of help from my husband Brian, we were able to get those very special extravagant paces under control which made Cracker one of the best driven dressage horses on the circuit ,he was rarely out of the top three. 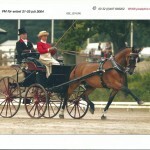 A driven carriage turnout requires a backstepper or groom who sits quietly on the carriage for the dressage and cones but their main role is to balance the carriage on cross-country and keep the driver up to speed. Leslie Mulholland from Donaghcloney has been part of the team for most of those years. 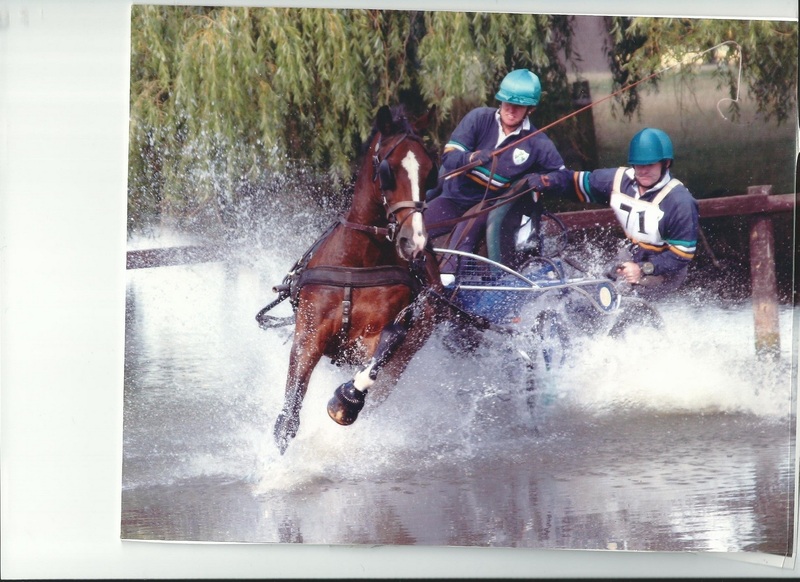 We represented Ireland at Royal Windsor on five occasions and competed at five world championships, Ebbs in Austria 1998 ,Conty in France 2002, Astorp in Sweden 2004, Pratoni del Vivario in Italy and Jarentow in Poland in 2008.As a team we won both the British and Irish championships and competed in numerous private driving classes at Balmoral, the RDS in Dublin and the Royal Highland show in Scotland. The bigger the occasion, the more flags there were the more the crowd clapped the better he liked it, the higher the step and more exuberant he became and the more he enjoyed his work but there were many less serious events to have fun in. We won the equivalent of a hunt chase or handy hunter at Ballinasloe on a couple of occasions, were we competed against other driving turnouts in a knock out class .Opening and closing gates, collecting shopping ,driving under washing lines over zebra crossing all great fun and rather hairy. One class I very much enjoyed winning was a ridden hackney class at the Hackney Show at Ballymena. When it was our turn to do our individual show we performed a very difficult and involved piece Cracker excelled as he was very well schooled under saddle .The crowd of spectators were very much taken back by the performance that a “driven hackney “ was able to achieve. 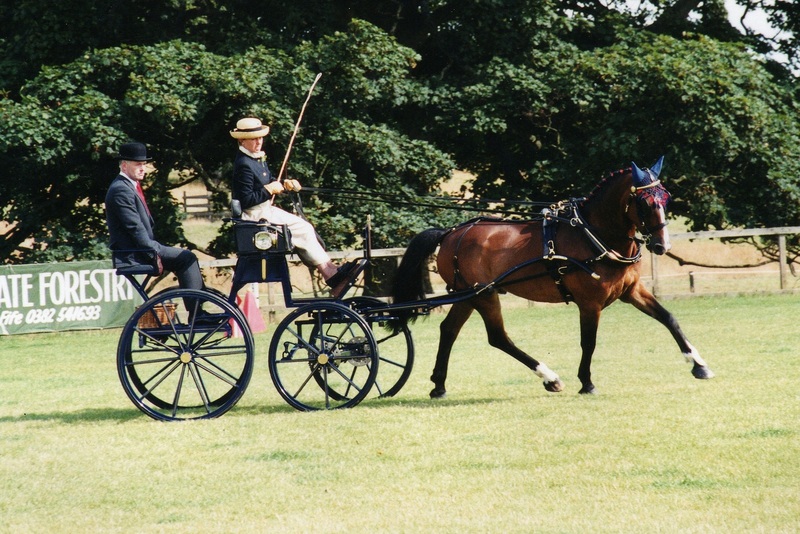 We won the class and were reserve champions of the show .The judge when giving me the rosette said he had never seen a Hackney horse perform such a brilliant ridden show and would have very much have liked to make us champion of the day but unfortunately it was a driving show and so felt unable to do so. The class was only ever run that one time. Cracker had gathered up quite a fan club over the years and although he has not competed for a year or so I have had numerous messages of condolence from folks both here and across the water. He was a little horse with a huge heart and he gave me many years of great competition here and all over Europe and many hours of fun. He is buried beside my first driving pony Just Honey, in a straw lined grave with his tail washed and his hooves oiled, the way he always liked to be turned out . He will be sadly missed and it has been a privilege to own him.